Peek into the kitchen at the rear of an unassuming A-frame building at 8334 Airline Highway during lunch or dinner and you’ll likely see a diminutive gentleman manning the stove or the food prep table. If you happen to catch 84-year-old Joe Urdiales handling a knife and engage him in conversation, he’ll make eye contact with you while he continues chopping onions, bell peppers, tomatoes or whatever’s on the chopping board before him. He still has all his fingers. When Urdiales isn’t darting around the kitchen, he’s probably patrolling El Rio Grande Mexican Restaurant’s dining area, chatting up new and decades-long regular diners, wryly delivering time-tested one-liners as he’s been doing for over 52 years. He’s the Mexican-American counterpart to Gino’s “Mama” Grace Marino. 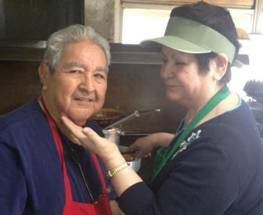 Urdiales is the patriarch of Baton Rouge’s first family of Mexican food, which has been running the city’s oldest Mexican restaurant since 1962. All four of his children have contributed to its longevity, including daughter Grace and son Raul, who mans the kitchen and handles most of El Rio Grande’s day-to-day operations. Daughters Felicitas (known as “Fefe”) and Elsa also have done their fair share of serving customers. When asked why he continues to work six days a week for what he calls “very low pay” when he has his children to run El Rio Grande, Urdiales quips, “God doesn’t want me to retire and she doesn’t want me in the house,” gesturing toward his wife of 57 years, Eva. A year and a half later, they were married. Together, they opened El Rio Grande one month after moving to Baton Rouge. Since then, the name Urdiales has become synonymous with Mexican food in this city. Joe’s younger brother Carlos haD his own place down the street, and Carlos’ son Jim owns Mestizo. While Eva was born in Coahuila, Mexico, Joe’s parents emigrated from Monterrey to the United States in 1917 and opened a Mexican restaurant (named El Rio, of course) in Lake Charles in 1940. However, that’s not where Joe first learned to cook. His first culinary lessons came courtesy of Uncle Sam during the Korean War, during which he served as an Army cook in Okinawa. “I stuck where the food was at,” Urdiales explained. After the war, rather than making money waiting tables, Urdiales asked his father to teach him how to prepare Mexican food. Those skills have been passed down to Raul, much to the delight of El Rio Grande’s numerous regular patrons, some of whom have been coming at least once a week since 1973. Most customers call him Joe. A select few get away with calling him “Dirty Urdy,” a childhood nickname born from his explanation to his classmates on how to properly pronounce his last name (“Dirty Alice” minus the D). In addition to the plethora of everyday customers, a number of famous singers and movie stars have come through Urdiales’ place. Long before state film tax credits made spotting celebrities commonplace in Baton Rouge, Urdiales fed the likes of Marty Robbins, Joan Fontaine and Steve McQueen. Urdiales says McQueen ate there three times while filming Nevada Smith in 1965, in fact, once in the kitchen, as evidenced by a photo near the front door. Whether Urdiales continues fixing authentic Mexican nachos, burritos and handmade tamales for another 52 years, or whether he hangs up his apron tomorrow, he’s made a lasting impression in the Baton Rouge food community. But more importantly, he and Eva have enjoyed the journey. “We’ve had a very happy life together,” he says.